Hosta Lancifolia is an old and very common hosta. Some sources say it was the first hosta ever grown in this country. 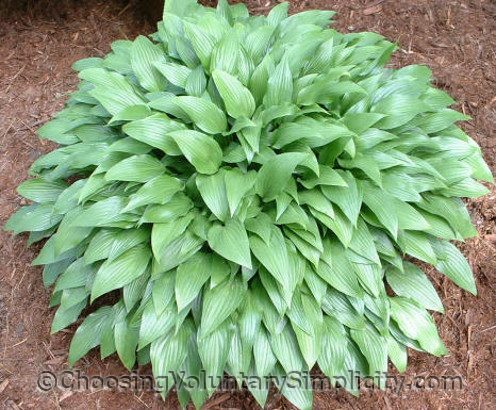 The medium green, lance-shaped leaves arch to form dense mounds of foliage, and for me the shape of the mound is this hosta’s most attractive feature. 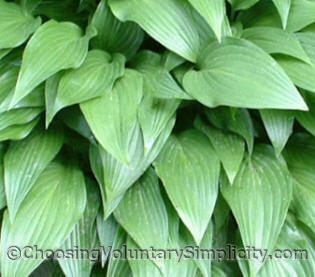 Although Lancifolia is an extremely easy hosta to grow, the leaves are thin and slugs can be a huge problem. This is one hosta that seems to thrive in almost any growing condition, although I have noticed that the leaves become a darker green in shade. All of my Lancifolias are several years old and average around 44 inches in diameter… these older plants are much larger than the size standard for this hosta. I have one of these, but mine sure doesn’t look as good as yours. How do you get it to be that nice a shape? Love your hosta photos!! You have some very nice looking hostas. Your hosta garden must be beautiful. I have about 50 hosta’s but some don’t grow so good for me and I think the soil isn’t very good. I like your site. Its very interesting. I’ve been looking at your garden pictures. Your gardens look like what I want my gardens to look like when I get done with them. Thank you for encouraging me by showing what can be done. I’m always glad to hear from people who love hostas. I’ve been growing hostas for quite a while, but I never get tired of them. Jeri, I think the shape comes from the hosta getting an even amount of light on all sides. I don’t do anything special… the hosta just grows that way, but I have found that when parts of my hostas are shaded, the part that is in the shade doesn’t grow as well as the areas that get more direct light. This is the first time I have heard about the vein count…is it always 100% accurate ? We are looking at a dead ringer for lancifolia but it only have 5 veins plus a mid-rib on either side. Most vein pair numbers are more of an identifying indicator than 100% accurate because the numbers given are not always for mature hostas. An immature hosta will have fewer vein pairs. Sometimes a range is given… for Lancifolia, the range is 6 to 9, I believe. The numbers I give on my site are for my own hostas. My Lancifolia has eight vein pairs, but it is a mature hosta that has not been divided for many years. Perhaps yours is a younger Lancifolia? I have this variety of hosta that I received about 25 years ago from a neighbor. The neighbor’s hosta has a similar environment but are a fraction of the size of mine. I factually attribute that to all the peat moss I amended the soil with, annually, when I had impatiens adjacent to the hosta. It has made a HUGE difference in the size of all of my hosta, along with watering them when needed. They really don’t like to be dry that long….they don’t complain, but are much happier and showier when given drinks!! Shirley, I’ve visited numerous hosta sites but I have never seen more pristine hostas than yours. Amazing. Here’s an unbelievable story and how I got hooked on hostas. I received my first hosta – a lancifolia back in 1980. It was about a foot wide and I brought it home to Barrie in a green garbage bag. Would you believe it overwintered in that bag because I got busy and forgot about it (bad). The next spring I looked down at the bag (I had the foresight to tuck the bag down so it could receive light and water from Mother Nature) and what did I find? A whole bunch of new shoots – I mean, the bag was full of these lovely green shoots. The love affair with hostas started right there. Talk about one tough perennial!!! I take good care of all my babies, but I repeat, your hostas are like stars from a runway!!! I love love love hostas but I live in San Diego. I brought one home on the plane from the east coast and while it is surviving (in shade) it is not thriving. Any hope? any suggestions?